The University of Leeds organises a Postgraduate Open Day every year. Details of our next postgraduate open day will be released in the autumn. Please register your interest to be the first to hear when we launch the booking form for our next event. By attending our open day you will discover why more than 9,000 students choose to study a postgraduate degree at the University of Leeds. Our open days are an opportunity to find out about the range of Masters and research opportunities Leeds has to offer, talk to our academic team about your subject interests, attend informative talks, explore the campus and our outstanding facilities. If you can’t attend an open day but would like to visit the University, we offer organised campus tours throughout the academic year. Guided by one of the University’s current students, you’ll have the opportunity to ask questions about life at Leeds. We offer tours most Wednesdays during term time, with more frequent tours available during peak times. one of our halls of residence. Depending on when you visit, you may also be able to visit schools within the Faculty, but you should contact the school in advance to avoid disappointment. Please be aware that during term time departments are not always able to accommodate visitors due to teaching commitments. For any queries about campus tours please email campusvisits@leeds.ac.uk or phone 0113 3436792. If you are an EU or overseas fee paying student, you can book an international campus tour. The tours, led by students, include the International Student Office, the Brotherton Library and our sports centre. They do not include visits to individual departments or accommodation. For further information contact the International Office. Every year, academic staff and other representatives from the University of Leeds travel overseas, to meet with students interested in studying in the UK. Take a look at our upcoming visits to find out if we are attending an event near you. 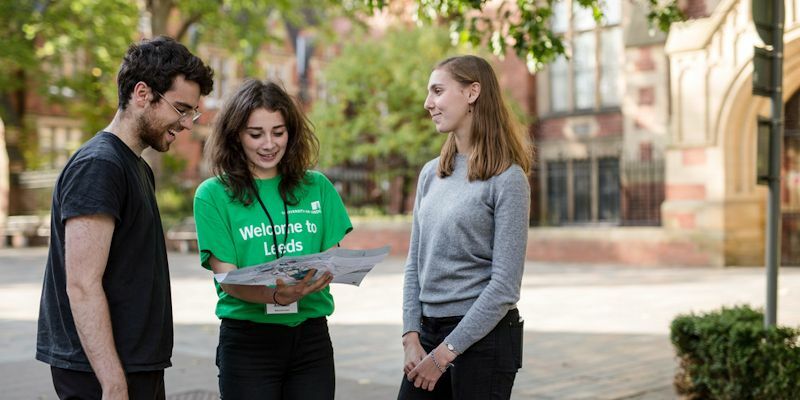 If you’re thinking of applying to or are an offer holder of the Faculty of Environment and would like to hear about other students’ experiences, you can speak with one of the Link to Leeds Ambassadors. They will be able to answer questions about life as a student at the University and what it is like to live in Leeds.